Being a part of the TOS Crew has been a rewarding experience, and we're not even six months into the year yet! The latest review, however, is one t I was so blessed to complete. I cannot begin to tell you the impact this book has had on my life, my family's life, and our outlook on home education in general. 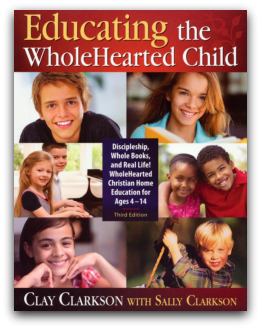 Published by Apologia Educational Ministries, Educating The WholeHearted Child (Third) Edition, is a must have your library. Clay and Sally Clarkson have added and edited to their previous edition and completed a masterpiece! You can also read the first chapter online, and see the table of contents to give you an overview of exactly what is covered. It is designed for ages 4-14. This is a HUGE book (372 pages) that I devoured in just a couple of weeks. As I sat at the ball field and read or sat at swim practice and read, several people spoke to me about what I was reading. I was proud to tell them about this book! Each section offers CONCRETE ways for you to become a WholeHearted Family. We have been implementing many of the strategies, checklists, and book suggestions already. More and more families are saying the old way has gone - no more formal classrooms, graded curricula. tedious textbooks, wearisome workbooks, and long lectures. In their place, a new way has come - the home, a God-designed dynamic learning environment, full of real books, real life, and real relationships. This book is all about converting to that new way of seeing and thinking about home education. The margins are packed with scripture, quotes, and inspiration in general. Each section is grounded Biblically. Everything we do with our children and in our homes is for the glory of God. We are training mighty warriors for Christ, and as such, must set up our homes in a way to do this. How to run my home and that my mission is my family and home at this point in my life. Sally Clarkson left me feeling so VALIDATED about what we do as homeschooling moms! You don't need to be a slave to your curriculum! WholeHearted Education isn't about curriculum - it is about structuring your LIVES to be educational and surrounding your children with what is beautiful. A plan and resources for Bible study with my children - AND myself! A plan and resources for each subject -- I LOVE the booklists of REAL books at the end of the book. The resources section is invaluble! The "Check Me Out" Dependable List, which we have been using for the past three weeks. Our home is running smoothly and the children are in a good routine - all grounded in scripture. I could go on and on about the book and how much I loved it, but for the price of $22, you should buy one immediately. If you keep nothing else on your homeschool shelves, this would be it. And it is our mission to help you paint the most beautiful, realistic, inspiring portrait of home and family for all the world to see and desire. We will help you keep faith in your family so it never fails or fades and keep faith in the family so you have confidence in the God who designed it. There's no place like home... with God in it. You can also read what others are saying about this book by visiting the Crew blog to read more reviews.